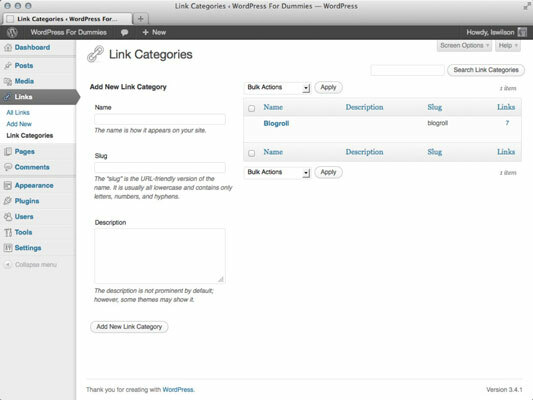 You can create multiple categories for your links on the WordPress Dashboard if you want to have more than one link list. Sometimes, having a large list of links below the Blogroll heading is just too generic, and you may want to display groups of links with different headings that further define them. By default, WordPress provides one link category called Blogroll. You can keep this name or change it in the same way that you change a post category name. Just click the name of the category and edit the details as you need to. Click the Link Categories link in the Links menu on the Dashboard. The Link Categories page opens. The left side of the Link Categories page displays the Add New Link Category section. Type the name of the link category in the Name text box. Type the slug of the link category in the Slug text box. This entry is the same as the category slug. (Optional) Type a description of the link category in the Description text box. Providing a description helps you further define the link category intent for your readers. The description can be as short or as long as you like. Some WordPress themes are set up to display the link category description directly beneath the link category name. Click the Add New Link Category button. The Link Categories page refreshes and displays your new link category. Revisit the Link Categories page anytime you want to add, edit, or delete a link category. To edit or delete a link category, follow the same steps as in the previous section for post categories. You can create an unlimited number of link categories to sort your link lists by topics.